This frame is an Extra Detail Magnification ("EDM") of yesterday's fascinating Contextual (or "CTX", for short) Frame, taken by the NASA - Dawn Spacecraft on September, 20, 2015, which shows us, once again, a very small portion of the Northern Hemisphere of the Dwarf Planet named 1-Ceres. The most interesting Surface Feature visible here, is a relatively small Unnamed Impact Crater whose East-North/East-facing Inner Slopes appear extremely bright. Considering the very dark color of its surroundings, the true reason of such an unusual phenomenon (note: "Vitrification" is just one possibility) is still fully unknown. Even though the Visual Angle and the Conditions of Illumination, as they appear in this picture, are quite different, please look, if you wish, at the APODs of October 8 and 9 for further information about this very same and truly unusually-looking Surface Feature. The very dark and almost rectangular Shadow (or is it, maybe, a really unusually-shaped Surface Depression?) visible to the East of the Crater is and remains - for now - another real mistery. Also the photo was taken from an altitude of approx. 915 miles (such as about 1472,5461 Km) from the Surface, with a resolution of roughly 450 feet (such as about 137,16 meters) per pixel. 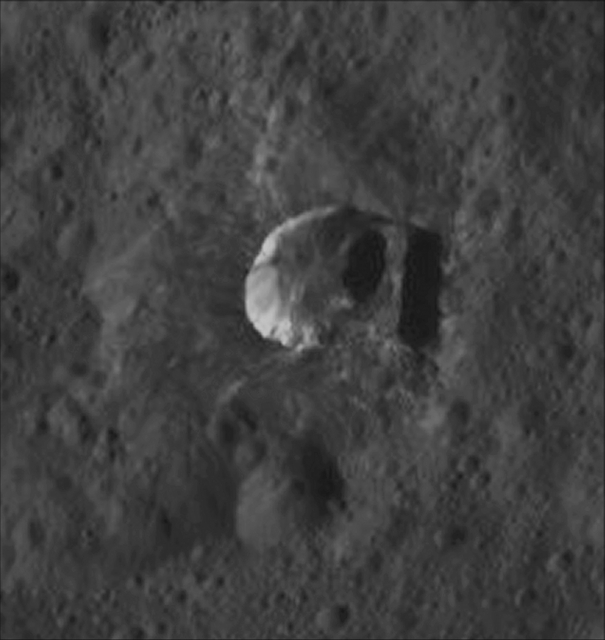 This image (which is a crop obtained from an an Original NASA - Dawn Spacecraft's b/w and NON Map-Projected frame published on the NASA - Planetary Photojournal with the ID n. PIA 19979 - Dawn HAMO Image 37) has been additionally processed, extra-magnified to aid the visibility of the details, contrast enhanced and sharpened, Gamma corrected and then colorized (according to an educated guess carried out by Dr Paolo C. Fienga-LXTT-IPF) in Absolute Natural Colors (such as the colors that a normal human eye would actually perceive if someone were onboard the NASA - Dawn Spacecraft and then looked ahead, towards the Surface of 1-Ceres), by using an original technique created - and, in time, dramatically improved - by the Lunar Explorer Italia Team.